Minisauripus - The Smallest Dinosaur Known? Home/Dinosaur and Prehistoric Animal News Stories, Dinosaur Fans, Main Page/Minisauripus – The Smallest Dinosaur Known? Minisauripus – The Smallest Dinosaur Known? A team of international scientists including researchers from Bristol University and the China University of Geosciences (based in Beijing), have published a paper reporting on tiny three-toed tracks found in south-western China that might support the idea that some Theropod dinosaurs were very small indeed. The footprints suggest that a dinosaur no bigger than a house sparrow ran across a mud flat more than 125 million years ago. The dinosaur is referred to as Minisauripus (pronounced min-nee-sore-ree-pus), it is an ichnogenus, the term applied to an animal that is only known from fossil footprints and trackways. Although the researchers don’t rule out the possibility that these prints might have been made by juveniles of a larger species, all the described examples assigned to this ichnogenus are small and so it is possible this is evidence of one of the smallest kinds of dinosaur to have existed. 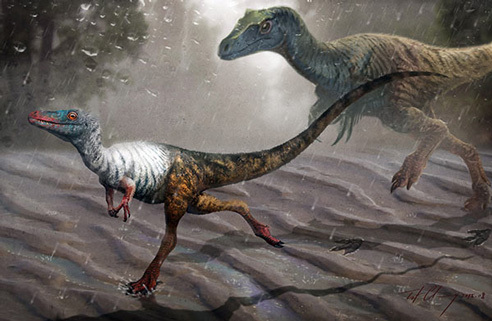 The picture above shows an artist’s impression of Minisauripus which may have been a compsognathid being pursued by a much larger Theropod, also known from fossil tracks – Jialingpus. The tracks are from exposed strata that make up the extensive Lower Cretaceous Feitianshan Formation, these rocks preserve trace fossils made on soft sand and silts that represent a low-energy lake (lacustrine) environment. A number of different types of dinosaur footprints have been identified at this location close to the town of Yangmozu (in Zhaojue County, Sichuan Province), twenty Theropod dinosaur tracks have been found, seventeen of these have been assigned to the larger Jialingpus, the remaining three tiny tracks are associated with Minisauripus. In total around seventy individual footprints have been identified from a 26 square metre section of rock. A scientific paper detailing this research has been published in the academic journal “Palaeogeography, Palaeoclimatology, Palaeoecology”. Other fossils assigned to this ichnogenus have been found elsewhere in China, there is also evidence of Minisauripus tracks recorded from Lower Cretaceous rocks in Korea. The ichnogenus Minisauripus compared to an oviraptorid and the hind foot of a Giganotosaurus. 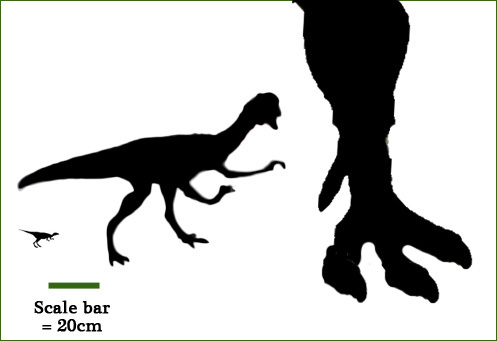 The picture above shows the minimum size estimated for Minisauripus (around 12 cm long), compared to a typical oviraptorid at around two metres and the hind leg of a giant Theropod (Giganotosaurus). The researchers cannot be certain that the tracks assigned to Minisauripus represent those made by fully grown individuals, however, all known examples of this ichnotaxon are small. All unequivocally identified Minisauripus tracks fall in the size range of from 1.0–6.1 cm. Assuming a small adult animal in each case, and based on standard foot length, leg length and body length ratios, all Minisauripus tracks indicate trackmakers with hip heights of less than 5 cm and ranging to 28 cm. This gives an approximate body size range of between 12 cm and 72 cm. Zhaojue County is officially recognised by the Chinese authorities as being one of the poorest parts of south-western China. There are plans to develop the mining industry in this part of Sichuan Province and scientists are lobbying the Government asking for safeguards to protect the ancient trackways and other fossil sites.